Grain-based salads are filling, versatile, and wonderful picnic foods. 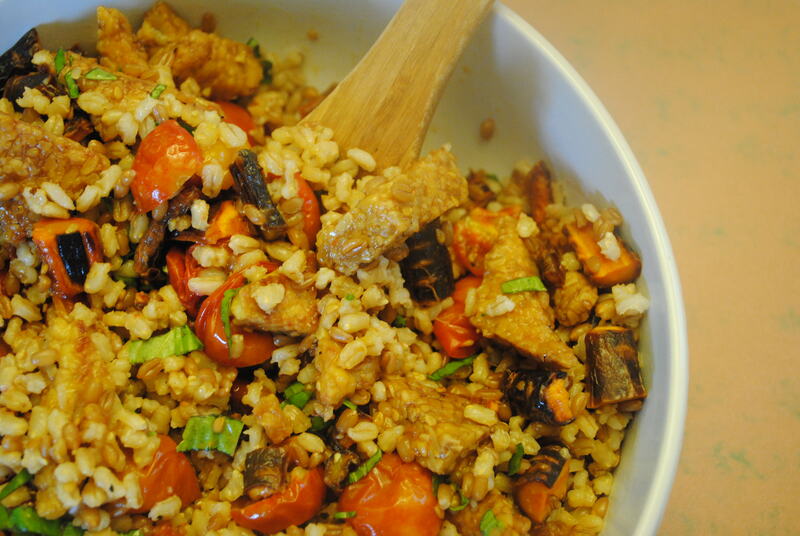 For this one, I mixed barley with some maple-roasted carrots and tomatoes and pan-glazed tempeh, and then sprinkled with a bit of sliced basil to brighten up the flavors a bit. It’s just slightly sweet. Wheat berries would also work instead of the barley, or even brown rice. If you’re not a fan of tempeh, just use chicken instead. Preheat the oven to 400 degrees. Combine water and barley in a large saucepan and bring to a boil. Reduce heat to a simmer and cook 40 minutes. If there’s any water left in the pan, drain it off. Set the barley aside in a large bowl. Combine vegetables, 1 tbsp maple syrup, 2 tbsp olive oil, salt, and pepper. Roast for 20 minutes, or until veggies are browned and tender. Add to the barley. In a small bowl, combine balsamic vinegar, 2 tbsp maple syrup, broth, salt, and pepper. Heat 2 tbsp olive oil in a skillet over medium-high heat. Add tempeh and fry about 5 minutes per side, until golden brown. Add vinegar mixture and cook, stirring as necessary to keep tempeh from sticking, until liquid thickens into a glaze. It’ll take about 10 minutes. Add tempeh to barley mixture and stir to combine. Sprinkle with basil and serve. Yummmmm!!! I used brown rice syrup instead of the maple syrup, turned out great. Great substitution idea. Someone’s been to Whole Foods! I am pumped to try this! I have all this at home YAY!